Since last week, I fileted and taped up all the new mast step components to the hull and feel that it really stiffened up the front part of the hull. For the next step, I wanted to really beef things up so all the loads imposed by the unstayed mast will be properly transferred to the hull and nothing will break (cross fingers). 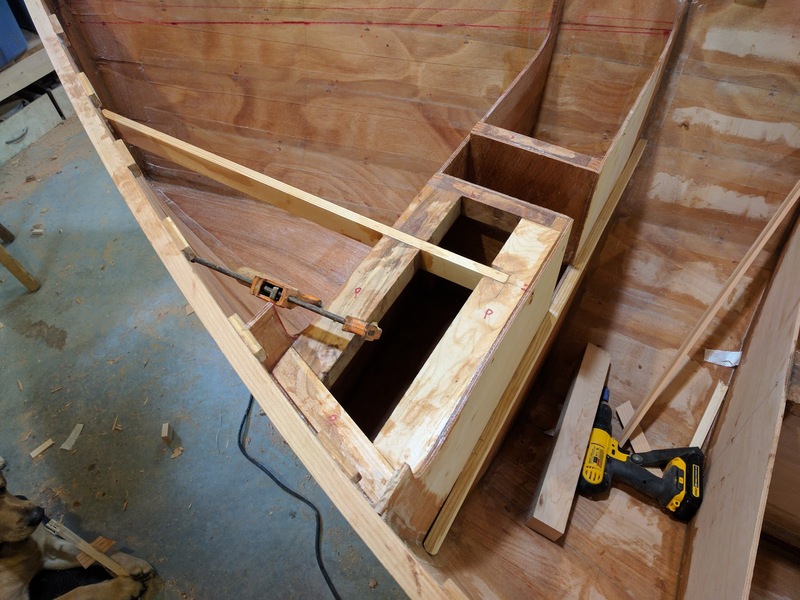 To do so, I needed to beef up the framing members at the mast partners so the loads will distribute laterally from the partners to the hull via these new members. Additionally, I decided to add a false bottom forward of the mast step that will tie the bow and sides into the mast step that should reduce or eliminate any twist caused by the loads. 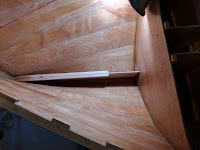 I started by measuring out a longitudinal frame running from the mast step to the bow about 100 mm above the keel. 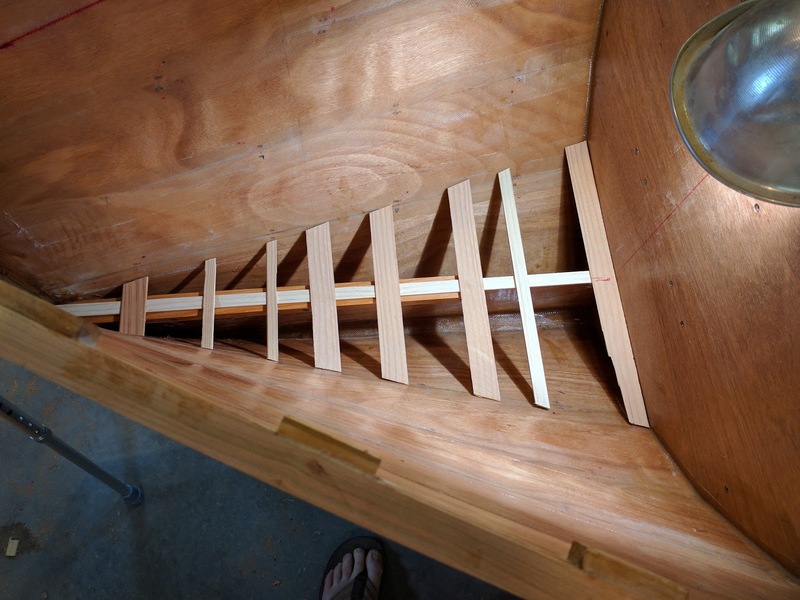 I glassed that in place with thickened epoxy and after it had kicked, I coated it with unthickened epoxy to encapsulate the wood and added some douglas fir stringers along the top edge to receive the false bottom. I left the aft section clear because I was planning on putting an inspection port in that spans both sides of the frame. I let it all cure for a day and then created a template with the hot glue gun and some random sticks to pattern the false bottom. I transferred the pattern to 6 mm marine plywood and cut it out for a first fitting. A little work with the rasp and it all seated quite nicely so I went ahead and cut out a hole for the inspection port prior to gluing it up. 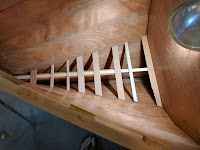 I coated what was to be the bottom side of the false bottom with unthickened epoxy to seal it all up and after letting it kick, I mixed up a batch of thickened epoxy and ran a bead along the longitudinal frame and smooshed the bottom in place. I fileted the bottom to the sides and mast step bulkhead before letting it all kick. 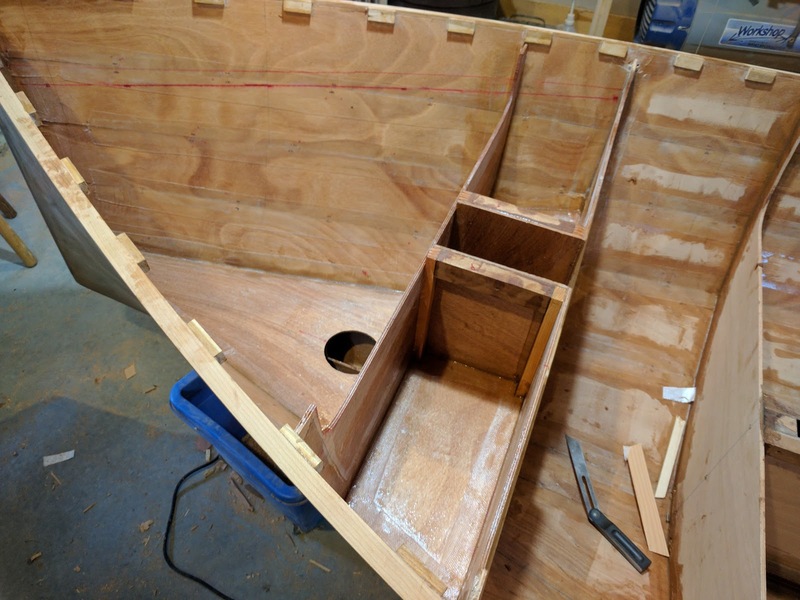 I stopped back at the shop later that evening after the epoxy had cured to the touch and mixed up a small batch of unthickened epoxy and taped the bottom to the hull and mast step bulkhead. 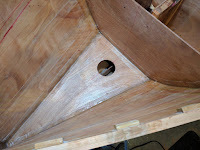 The next day I started beefing up the top of the mast partners by epoxying in 25 x 35 mm mahogany pieces that run from the mast step along frames 10 and 11 to the sides of the hull to distribute the load from the partners to the hull. 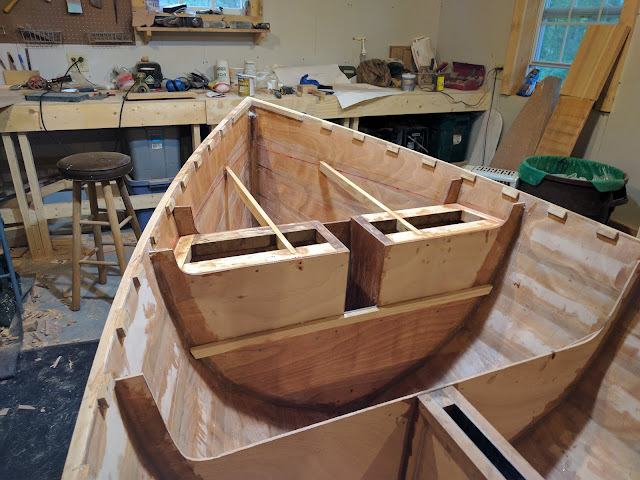 I morticed a notch on each side of the aft piece for the beginnings of the deck framing as well. I feel like I'm using all the wrong terms here and I'm guessing all of these pieces have specific names, but the pictures below should give you an idea of what I'm talking about.